Go to the Cloud CME website. 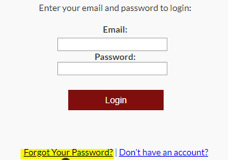 CloudCME will then send an email to the email address in your account and it will prompt you to reset your password. After you’ve reset your password, return to the main page and Sign In. If you cannot remember your account password, call our office at (501) 661-7962 and we’ll be happy to help. Sign In to your CloudCME Account. Click on the My CME button. Click on the Transcript button. From there you can Download and Save, Email, and Print your transcript. You can change the date range. Hit the enter button after changing the date and the page will refresh. You can also Upload certificates and transcripts from other accrediting bodies and keep your records all in one place. If you have any questions or concerns, please contact the OCE at (501) 661-7962.